Protesters with Palestinian Authority flags turn backs on Dutch rabbi’s Christchurch eulogy. Demonstrators carrying Palestinian flags turned their backs on a Dutch chief rabbi during his eulogy at a vigil for Muslims killed in New Zealand. The incident Sunday happened as Rabbi Binyomin Jacobs was discussing the meaning of a minute of silence at the gathering at the Dam Square World War II memorial monument. 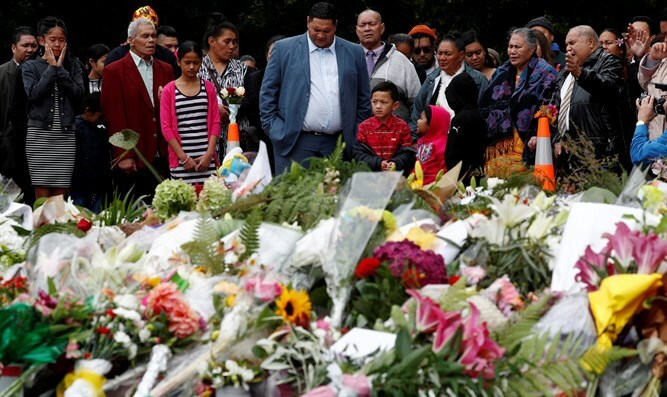 Thousands of people, many of them Muslims, gathered at the square to commemorate the 50 people slain Friday by a shooter at two mosques in Christchurch, New Zealand. When Jacobs, the chief rabbi of the Inter-Provincial Chief Rabbinate of the Netherlands, got up to speak, several participants carrying Palestinian Authority (PA) flags demonstratively turned their backs on the rabbi in what many Dutch Jews on Twitter called a display of anti-Semitism. Anti-Semitic behavior is commonplace occurrences during anti-Israel protests on the Dam by activists promoting the Boycott, Divestment and Sanctions (BDS) movement against Israel. They routinely wave PA flags during these bi-weekly gatherings. Mayor Femke Halsema and several other municipal officials responded to the actions of the protesters who turned their backs on Jacobs on Sunday by standing shoulder to shoulder with the rabbi during his address.